This advertisement is being seen at least 4000 times per day by people wanting accommodation, tours, and Cotswolds information. 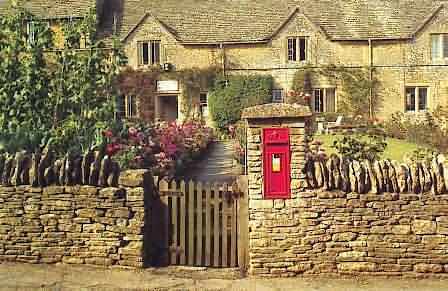 Ralph Green lives in Bourton-on-the-Water and used to work for many years at the Stow-on-the-Wold Visitor Information Centre. I never thought much about the dry stone walls that mark out the Cotswold Hills until I started working in the Tourist Information Centre in Stow-on-the-Wold. One day an American visitor called into the Centre and started to tell me how, on a previous visit, he had been so struck by the beauty of our walls and the fact that no mortar was used that he decided to try his hand when he returned home. It hadn't been as easy as it looked but he stuck at it and eventually created something to be proud of. His neighbours had shown great interest and the local press had reported on his endeavours. Since that meeting, many visitors have mention our walls and how they contribute and enhance our beautiful Cotswold landscape. This caused me to look at our countryside with a different eye and made me realise that this feature, which I had ignored for so long, held everything together, and gave the hills and valleys some sense of unity. Such as been the continually interest of visitors in dry stone walls, we decided to research the subject and print up a simple leaflet to hand to anyone who wanted to take something away with them. 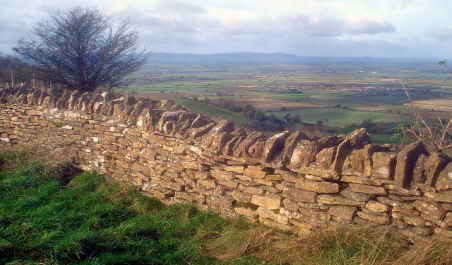 Dry stone walls are found in many parts of the country, wherever stone is abundant, but nowhere is the material more suited to the job than on the Cotswold Hills. It is quarried and delivered to the sight with two sides roughly parallel. Building starts by removing the turf and setting large blocks as foundation stones, usually beginning at the gateways. The wall is 2 ft. wide at the bottom and narrows to fourteen inches at the top; this narrowing is called a `batter'. As the wall grows it is filled in the middle with small stones and every so often a'bonder' or 'througher' is put in to hold the two faces together. Sometimes these are left sticking out to serve as a stile. 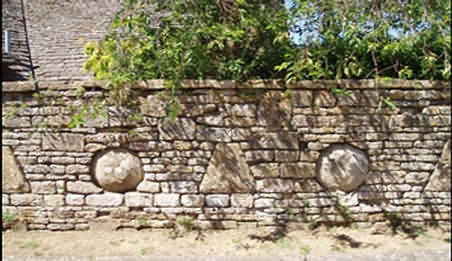 Each stone is tilted slightly downwards to the face of the wall with a packing of small stones to throw out any water that gets inside. At the required height, rows of stones are set upright to complete the wall. 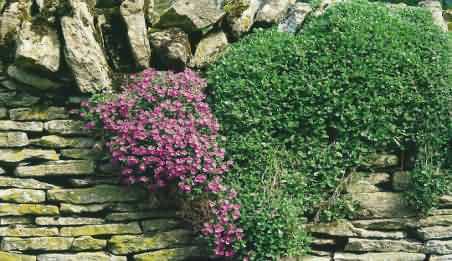 In villages and around churchyards these are often 'dressed' as rectangular blocks to give the wall a more finished look. As no cement or earth is used the air can get through and the wall remains dry. A properly built wall will last many hundreds of years with only a little attention. There were two great wall building periods on the Cotswolds, at the time of the enclosures in the 18th century and the times of depression in the 19th century when the great landowners built walls around their estates to provide employment for those who were out of work. The craft, or is it an art? of dry stone wall building goes back 5,000 years to the Stone Age, when many of the long barrows on the Cotswolds had dry stone walls at their entrances and along the sides. Since meeting the visitor who tried his hand at building a dry stone wall, I have met one other person who built a wall and another who was going home to have a go. They were all from the U.S.A. so perhaps somewhere at the edge of the Rocky Mountains are foothills that are slowly been turned into the Cotswolds! Those of us who live in the area give little thought to walls, but in their way, they contribute as much to the beauty of the Cotswolds, as do our attractive villages. For those who would like to learn how to construct dry stone walls by either volunteering, attending a course or via a working holiday please see details at www.cotswolds.info/activities-walking-cycling-golf.shtml#dry_stone_walling.